You have probably heard the name of gazpacho, which is a cold vegetable soup available all over Spain. It is served cold and is very refreshing during the hot summer months. 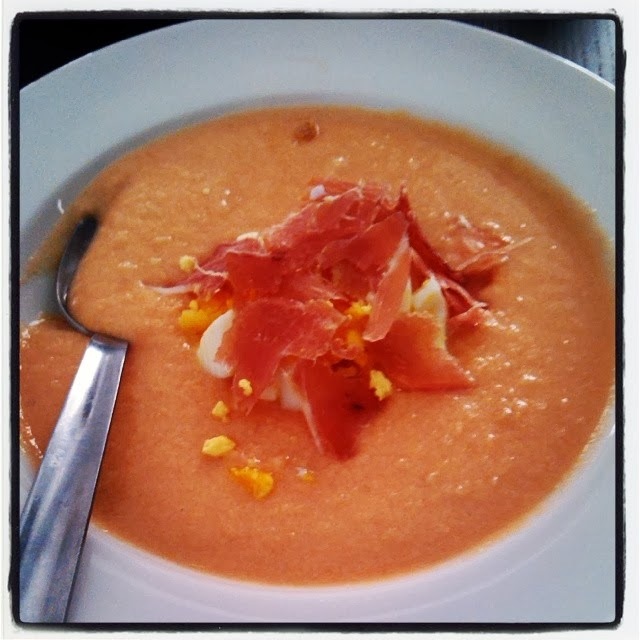 Salmorejo is a twist on basic gazpacho and in Andalucia this variety is definitely more popular. It is VERY easy to make, in fact, it's so easy that even I had a go at making it. This is how the big event turned out. You will also need a blender/food processor. We're going to throw everything together, except the oil. - put the tomatoes in the boiling water. After a minute or so the skin will start to break up. Take them out and put them in the bowl full of cold water. When they cool down, peel the skin off. - pour the puree on the bread. Our bread was still quite soft and soaked up the goo quite quickly but if the bread is dry you have to wait a bit until it softens up enough to go into the blender. - cut up the garlic to small pieces and mix it in the pink goo. Step 4 - blend the hell out of the stuff! Not sure this needs any more explanation. This needs to be done slowly, adding only a small amount of oil. Throw in some salt, too, if you want. This is the hardest part but believe me, it's worth it. Put the whole concoction in the fridge. During the night all the flavours mix together and by the next day it will taste even better. Unfortunately Paul knew exactly how easy it is to make this dish but if you serve it to somebody who has never tried it just say that it took you a whole day to make it (and in theory, you don't even have to lie, nobody needs to know about the helping hand of your fridge). The usual toppings are boiled egg and jamón. Even though this soup is a summer dish therefore 'slightly' out of season I was extremely proud that I made it myself and I can't wait for Paul's family to come over so I can wow them with my amazing cooking skills (I'm famous for not being able to cook). There are many varieties of this dish. Once we had the chance to taste three different kinds, one was made using the original recipe, the other with avocado with goat cheese, and the last one with squid ink with mussels. I'm sure you can figure out which one is which.